If someone asked me what my 5 favorite memories were as a child, traveling and sleepovers would definitely be 2 of them! I always loved going on road trips with my family. It was always a new adventure! Unfortunately, this was not the case for a friend of mine growing up. Because he wet the bed, he was too embarrassed to spend the night anywhere but home. When his family went on vacation, his siblings would fight over who HAD to share a bed with him. My heart ached for my friend as I saw part of his childhood robbed from him over something as simple as night time wetting that he had no physical control over. When I started having my own kids, and realized that they were struggling to stay dry at night, I promised myself that they would NOT have the same experience that my friend did! NO CHILD should ever have to feel shame or be made fun of because they wet the bed! So far, we have been successful and my kids are enjoying their lives to the fullest. Three of my kids still experience bedwetting in different ways, but we’ve learned a few tricks for making traveling and sleepovers an enjoyable and fun experience regardless of the bedwetting. 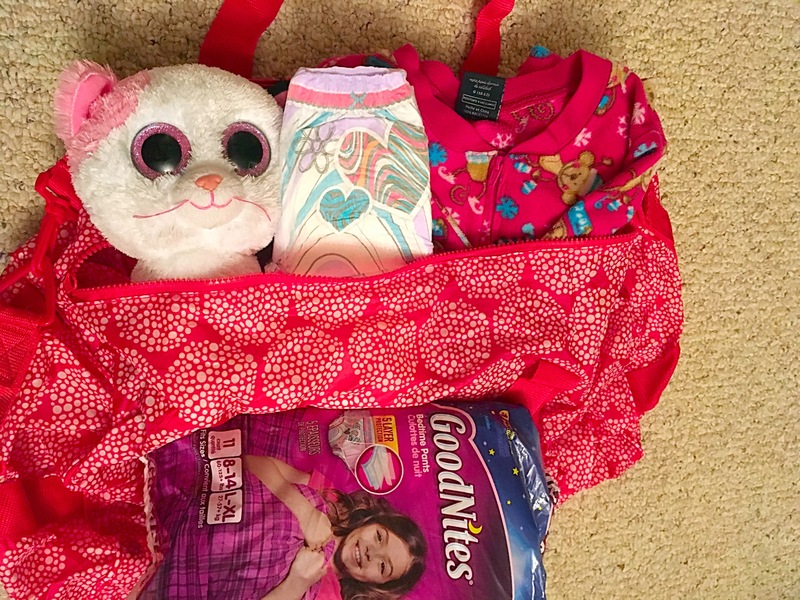 Honestly, traveling has NEVER been an issue for us because we use GoodNites® Bedtime Pants for all my kids and they work so well I sleep just as soundly as my kids now, knowing there will be no leaks throughout the night. I was paranoid at first and always put towels under them, until I realized how well GoodNites® worked. They have 5 layer protection in areas where girls and boys need it the most so I am able to use them on both my boy and my girls. Plus, my kids love that they’re discreet and easy for them to use on their own. No one even has to know they’re wearing them – they’re virtually invisible under pajamas. Problem solved, and now we just enjoy our vacations without a second thought about bedwetting. Sleepovers with friends are also exciting! I try to remember that childhood excitement when my own kids ask if they can spend the night at their friend’s house. With 4 kids, it feels like we’re always having sleepovers lately, but they’re having fun, and they won’t be kids for long. I was worried as my kids got older that they would be embarrassed to spend the night at their friend’s house knowing they still wet the bed. We were lucky that our kids adjusted well to sleepovers and travel, but sometimes it’s helpful to host the sleepover at your house before your kids go to a friend’s house. There’s comfort in familiar settings and routines for kids when they first experience change. You could also try having a sleepover at grandma’s house to help your kids gain confidence and feel more comfortable sleeping away from home with GoodNites®. Once they realize that is not the case, it’s no big deal anymore! It cracked me up, but it made her feel better. After texting we found out that her friend’s mom was totally fine with it and that my daughter wasn’t the only one to spend the night at her house that wet the bed. Bedwetting is such a normal part of life and doesn’t need to be stressed over. It can sometimes feel like you are the only one going through this. Not so! Remember, 1 in 6 children between the ages of 4 and 12 experiences night time wetting. Find an easy solution that works for your family and helps your child move on with their lives. For us, that solution was GoodNites® Bedtime Pants that are amazing at helping to keep those sheets dry every night. That’s a YAY for your kids and a YAY for your laundry load! Like I said before, they grow up fast! Make the most of it NOW. You’ll never regret it when they are gone and on their own!